Model displaying beautiful light pink and violet lehenga in shimmer faux material with heavy gold embroidered patches, sequins buttes and three horizontal bands at the bottom in gold, violet and pink combination. It is paired with sleeveless collar neck saree blouse with heavy embroidery around the neck. This beautiful art piece is designed by Vikram Phadnisat Day 5 Aamby Valley Indian Bridal week 2012. Model displaying beautiful black embroidery saree with lace border paired with short sleeves saree blouse at Pune Fashion Week 2010 from designer Vikram Phadnis. Model displaying beautiful sari blouse design for back at Bangalore Fashion Week from designer Vikram Phadnis. The India International Jewellery Week concluded yesterday but Gitanjali held a big fashion show today at the same venue called Bollywood Nights. Bipasha on hte ramp in a creation by Vikram Phadni. Vikram Phadnis Collection at Shagun 2010. Bollywood actress Malaika Arora walk the ramp for designer Vikram Phadnis at Shagun 2010. Fashion Designer Vikram Phadnis bridal creation makes heads turn at an event in Mumbai. Models walking the ramp on the background score of Hindu chants and live wedding band playing at the ramp, lent a perfect ambiance to the bridal collection by fashion designer Vikram Phadnis.Held on Thursday in Mumbai,the show was applauded for its stunning creations.With wedding season just round the corner,the collection was perfectly timed by Phadnis,who had worked hard to put it together. The outfits were adorned with heavy embroidery work and stones,pearls,crystals were used creatively to add on to the glamour of the outfit. Phadnis aslo involved bollywood actresses to walk the ramp in his creations which were lots of appreciation by them. Phadnis show was part of the gitanjali luxuy style fest which is India's first luxury event that celebrates highlight in most exonerate manner. Check out designer Vikram Phadnis collection at Lakme Fashion Week Spring Summer 2010. 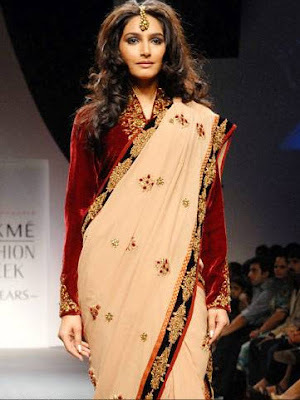 Bollywood actress Susmita Sen displaying designer vikram phadnis creation at Lakme Fashion Week 2010.